“It all makes sense until you start playing!” cried more than one singer while preparing this recording, according to Iain Burnside’s booklet note. That was not just a cry of despair but also an insight into the nature of Medtner’s song-writing; Francis Potts’ note on the music suggests that sometimes “…a vocal solo part emerge[s] as the by-product of a preconceived harmonic and pianistic scheme, as opposed to a melodic line providing the…harmonic logic for its accompaniment.” So these songs can seem as elusive as Medtner’s piano music has been for many music-lovers. However, as with the piano music, so with the songs: persistence and familiarity bring rich rewards, but achieving familiarity requires recordings, and those have been rather few and highly selective – until now. Following 2014’s complete Rachmaninov Songs (Delphian DCD34127), pianist Iain Burnside rejoined three of the singers from that set (Siurina, Gringytė and Pogossov) and added three more (Palchykov, Tritschler, and Didenko) for this two-disc survey of Medtner’s songs. This again enables songs to be allocated to the voice type best suited to them, and avoids the compromises usually involved in a single singer survey. This applies even within publications, so that selections from a single opus number are also mostly shared among singers. 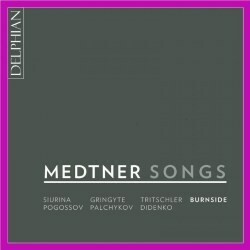 There are fifty-four selected songs here from throughout Medtner’s career, which is about half the published total. The songs also give the clearest picture of any musical genre of Medtner’s dual German and Russian heritage; his gods were Goethe and Pushkin, and he frequently set both poets and in their original languages. Medtner was a professed cultural conservative; his 1935 book The Muse and Fashion was in part a diatribe against leaders of the musical avant-garde like Schoenberg and Stravinsky, but this set shows that Medtner too, within his own terms, has his innovative moments. He also expects the accompanist – if that is still the term for songs with piano parts like several of these – to be as able a pianist as he was. Medtner’s flair for song writing should not really surprise us, as he wrote many short quasi-narrative piano pieces called Skazki (“Tales”) and was a sophisticated student of poetry. Thirty-nine of these fifty-four songs are less than three minutes long, so no song outstays its welcome. Nor does earlier mean lesser in this collection; as his friend and great admirer Rachmaninov said, “Only Medtner has, from the beginning, published works which it would be hard for him to equal in later life.” But equal them he did. The quality is quite even – and very high – throughout. All the singers bring something individual to this remarkable range of songs. The one Russian tenor (Oleksiy Palchykov) brings more fervour than finesse at times, but then, many of the songs he is allocated are very fervent, and his ringing timbre suits them very well most of the time. The mezzo-soprano Justina Gringytė has a squally moment when under pressure in the Goethe song ‘Vor gericht’ from Op.15, but is a great asset everywhere else. Bass Nikolay Didenko has terrific weight and authority in Russian, but less so in his three Goethe songs, where his German pronunciation can be approximate. However, these are only small blemishes in well over two hours of fine singing from everyone. Robin Tritschler is as excellent as ever in his various German songs. He is not allocated any in Russian, which is fair enough in this company. The baritone Rodion Pogossov has many of the best songs, or perhaps it is just that his vocal quality and ringing ardour make them sound among the best. Certainly the Pushkin settings ‘Winter Evening’ Op.13/1 and ‘Echo’ Op.32/1 are among those I replayed at once. Finally, soprano Ekaterina Siurina has considerable vocal charm and allure, with a piercing sweetness when the line lies just right for her, bringing a sort of Russian reminiscence of Gundula Janowitz. The climax of ‘Arion’ Op.36/6 is a stretch maybe, but everywhere else she offers only enchantment - as does the whole set. The recorded sound catches the voices well enough but the empty Greyfriars Kirk acoustic is a bit too reverberant for a song recital and also makes the piano sound rather clangourous in the loudest moments. Ideally, something more intimate was needed, but one soon adjusts. The notes are excellent and of course full texts (Cyrillic for the Russian songs) and English translations are provided. Robin Tritschler (tenor), Oleksiy Palchykov (tenor), Justina Gringytė (mezzo-soprano), Rodion Pogossov (baritone), Iain Burnside (piano).